Dance Lessons and More Coming Up at the Commons! Whether you hit the dance floor regularly or are just curious about testing your feet for the first time, this Saturday is the perfect time to head to Third Place Commons. Delicious Dance instructors Mark Willson and Margot Richardson will be on hand to offer a free community swing dance lesson that will get everyone moving and in the mood for a great night of music ahead. No partner is required and everyone is welcome, so don’t miss the fun starting at 6 PM. 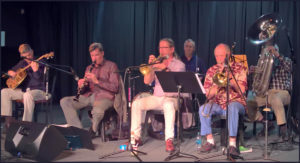 Then at 7:30, the Market Street Dixieland Jass Band takes to the stage with a hot night of New Orleans jazz and 20s style speakeasy music custom-made for dancing! 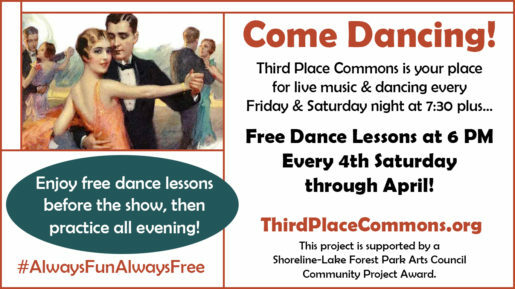 The dance lessons continue on the 4th Saturday of each month through April at the Commons. So polish up those dance shoes and be sure to mark your calendars for March 24th and April 28th. This project is supported by a Shoreline-Lake Forest Park Arts Council Community Project Award. Of course, you don’t have to wait till Saturday to dance. 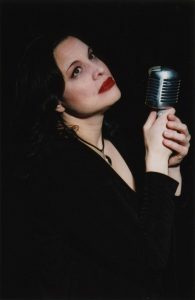 Friday night at 7:30 you can get into the groove with the sultry Alma y Azucar who offer up an exquisite and passionate selection of Latin styles and flavors for everyone. Or you can work on your foreign language skills over the next week with a friendly community of beginners to advanced speakers practicing their German and Irish (twice a month) on Monday, French on Tuesday (weekly), and Spanish on Thursday (weekly). Check the Commons’ online calendar for times and details on these and dozens of other events throughout the month. And don’t forget that the Annual Community Breakfast will take place on Thursday, March 8th at 7 AM. The event will feature a musical welcome performed by the Milner Family Fiddles, a lively and fun action of great items, and highly regarded featured speaker, Ron Chew. Diane Hettrick, editor of Shoreline Area News, will also be honored at the event with the Friends of the Community Award. Find out more and get your tickets here to show your support for Diane, the Lake Forest Park Farmers Market, and your whole Commons community. Third Place Commons is a community-supported nonprofit organization dedicated to fostering real community in real space. Third Place Commons hosts over 900 free events per year and presents the Lake Forest Park Farmers Market each year from May to October. See you at the Commons! Previous Post: Meet Breakfast Speaker Ron Chew! Next Post: Get a Sneak Peek at the Breakfast & Auction!